DEAL is a DES-based block cipher proposed by Knudsen. The block size of DEAL is 128 bits, twice as much as the DES block size. The main result of the current paper is a certificational attack on DEAL- 192, the DEAL variant with a 192-bit key. The attack allows a trade-off between the number of plaintext/ciphertext pairs and the time for the attacker,’s computations. Nevertheless, the DEAL design principle seems to be a useful way of doubling the block size of a given block cipher. Supported by German Science Foundation (DFG) grant KR1521/3-1. 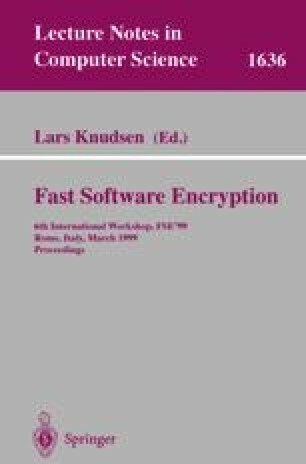 L. Knudsen: “DEAL-a 128-bit Block Cipher”, February 21, 1998, revised May 15, 1998: http://www.ii.uib.no/~larsr/aes.html.